“Wedding tax” is when venues and suppliers add extra costs for the privilege of putting on a wedding. Getting married should be a stress-free and enjoyable experience. After all, for many of us, it’s the most expensive day of our lives. Unfortunately, this isn’t always the case, with many couples left burdened by excessive wedding costs. This is partly due to venues and suppliers adding extra costs for the privilege of putting on a wedding. Known as a “wedding tax”, it means that once suppliers get a whiff of a wedding, couples look to pay considerably more for photographers, venues, DJs and food. 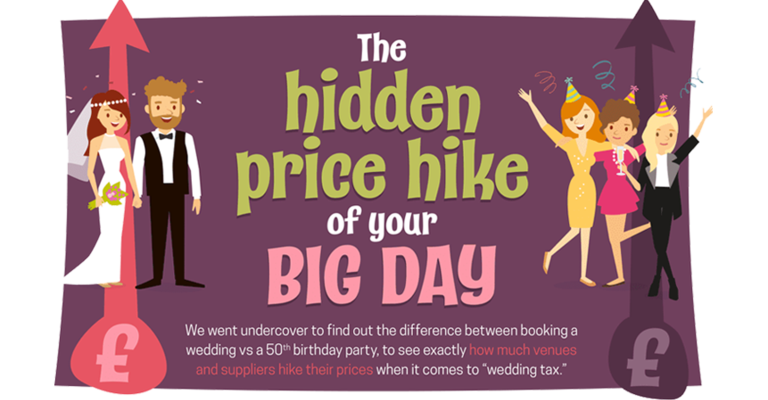 To learn more about the wedding tax, the Amigo Loans team went undercover, learning a few lessons about cost-cutting along the way. Amigo Loans contacted 24 venues and 72 suppliers across the UK, asking each for wedding and party quotes based on 80 guests. 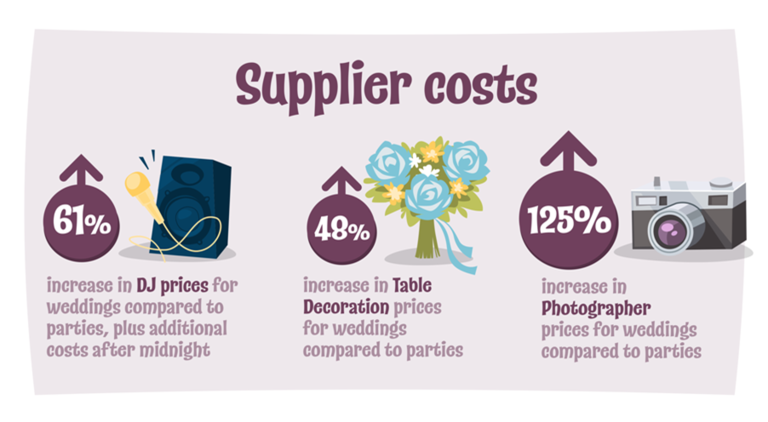 From DJs and photographers to food and table decorations, we were shocked to find that many suppliers charge considerably more for a wedding than a birthday party. 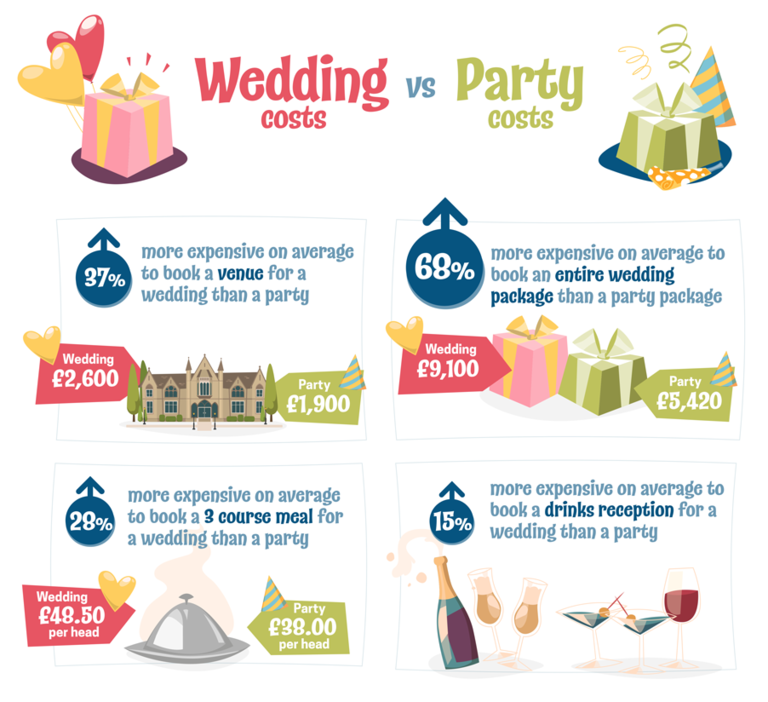 When we enquired about booking both party and wedding packages from the same venues, we were astonished to find that, on average, the price increased by a whopping 68 per cent for a wedding. We also discovered that couples are likely to pay 37 per cent more for the venue alone when they say it’s for a wedding. And it didn’t stop there. A number of venues said they had ‘no availability’ when we enquired about party bookings over the summer months, but seemed happy to accommodate weddings. With such a high demand for weddings during this period, it’s clear that venues see this as much more attractive offer. Especially since our team also discovered a number of venues asking for minimum spends of £6.5K during peak times! When it comes to booking photographers and DJs, we’re often in the hands of suppliers’ packages, as both understand that many couples want some memorable entertainment on their big day. However, what we hadn’t anticipated was just how severely inflated these wedding costs would be when compared to parties. While photographers charged, on average, 125 per cent more, so did DJs, who hiked their quotes by 61 per cent for a wedding, with an additional cost for music after midnight! Like many venues, some of the DJs we spoke to were available for weddings, but ‘fully booked’ for a party on the same date. While our investigators found that table decorations can cost up to 48 per cent more for a wedding, we also uncovered that a three course sit down meal can rise by 28 per cent, too. Coming in at around £48.50 per head, (rather than £38 per head for a party), drinks packages also rose by 15 per cent for the bride and groom. Saturdays are the most expensive day to book a wedding. To save some cash, try and avoid these peak periods by booking out of a season or on a weekday. In some cases, you can reduce your bill by half! Watch out for hidden costs like meal tasting. When you’re shopping for different food packages, caterers will often charge around £35 per head, just for testing out a meal. To save a few quid, try asking for your tasting session to be included within your package. Make sure your wedding bill includes VAT. 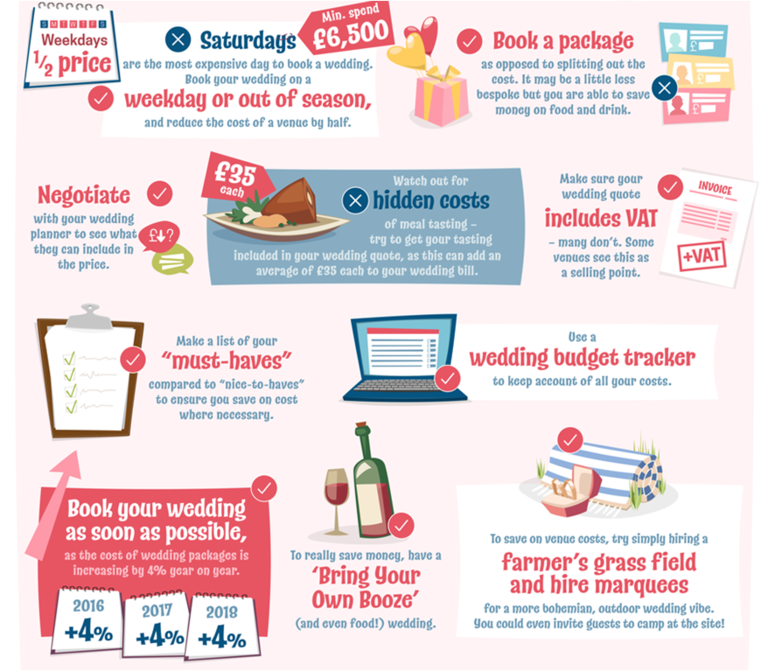 Use a wedding budget tracker to keep on top of your costs.